Fixed access ladders provide easy access to roofs, mezzanines or loading docks. Ladder rungs are made with 18"W x 3/4" diameter solid steel and are spaced 12" apart. 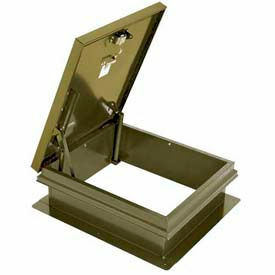 All welded steel access ladders have sturdy 2-1/2" x 3/8" flat steel side rails and 7" stand off brackets. 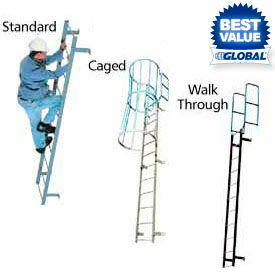 Standard Uncaged Access Ladders allow easy access to rooftops. Walk Through Ladders have 42"H handrails at top to meet strict CAL OSHA regulations for easy access and exit and mounting to rooftop. Caged Walk Through Ladders provide extra safety. Access ladders are available in Gray or high visibility Yellow enamel finish.